Walking - Don't let your dog walk ahead of you. If he is ahead of you on a walk, he will walk all over you in all other areas of your relationship! Loose Leash - Always walk your dog on a loose leash. Tension on a leash can cause frustration which may be taken out on other dogs or moving objects. A Tired Dog is a Good Dog - Fulfill your dog's needs both mentally and physically. A 15 - 20 minute run, twice a day will serve your dogs' physical needs. 30 minutes of obedience training will have a therapeutically profound effect on your dog and will serve your dogs' mental needs. Attention - You can't teach a dog if you do not have his attention. Get his attention first before you give a command. Reinforcement - Never give a command that you can't reinforce. Mom Says ONCE! - Give a command once, then correct if the dog does not obey. If you repeat a command more than once, you will teach your dog that the command has no meaning. Jobs - If you don't give your dog a job to perform at, hewill eventually find one himself and you won't like what he chooses! Calm and Assertive - Do not yell and scream at your dog when he is behaving badly. Down Stay - Do a 30 minute down stay, twice a day. This will reinforce your role as the Alpha leader. Arriving Guests - Before your guests arrive, crate your dog or put him in "place." No one enjoys being greeted by an out of control dog! Eating and Entering Passageways - Eat and enter all passageways before your dog does. Alpha's always eat first and enter all areas first. Attachment - Don't let your dog follow you around like a laser guided missile. This behavior can lead to separation anxiety. Love and Discipline - Always balance love with discipline and structure. If love was all that was needed, my business would not be thriving! Tonality - Tone of voice is extremely important. A high pitch tone is a sign of approval and a low tone is a sign of disapproval. Your dog will clearly understand this. Praise - Praise your dog for doing something right. Praise does not always mean you have to shower your dog with affection. It simply means you need to say "Good boy / girl" in a high pitch tone of voice. Elevating Status - Don't allow your dog on the furniture or on your bed. If you allow your dog to be on the same level as you, you are elevating his status and lowering yours. This is clearly not the way to establish yourself as the Alpha Leader. Ignoring Problems - Ignoring problem behavior will not make it go away. Ignoring is condoning and condoning is approval in your dogs' mind. Corrections - Correcting your dog must have meaning. If your correction is not strong enough it won't have meaning for your dog. If it doesn't have meaning, there is no motivation for your dog to stop the bad behavior. Behaving Badly - Dogs behave badly because they know they can and they don't understand it is wrong. 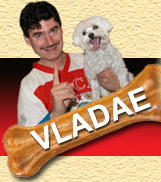 Vladae Roytapel, known as "The Dog Wizard," is the owner of Alternative Canine Training which is one of the most successful in-home dog training companies in the world. To learn more tips and secrets from the Dog Wizard, please purchase our set of DVD's which are guaranteed to have a profound affect on your dogs behavior.